Further Adventures with a 3″ Achromatic..
An amazing performer; the Orion SpaceProbe 3 reflector. Dedicated to John Wall (1932–2018). a chromatic: literally, without colour. There has never been a better time to begin the hobby of telescopic stargazing. In past generations, owning a good telescope often proved to be an expensive venture, typically involving many months or even years of saving up. Thankfully, such days are well and truly behind us. Today, you can purchase a decent quality telescope for a very light financial outlay. Indeed, I always advise novices not to spend a great deal on their first telescopes, especially if they are unsure whether or not they intend to pursue the hobby in the longterm. In addition, many people will end up being ‘casual’ or ‘occasional’ observers and so splashing out lavish sums of money on an instrument that sees little net use doesn’t make a whole lot of sense. In this capacity, one of the best novice ‘scopes I have personally come across is the Orion SpaceProbe 3 reflecting telescope (pictured above, fully assembled), which set me back about £70. That money bought me a very good 3 inch (76mm) telescope, together with a decent mount and two good quality eyepieces delivering magnifications of 28x (using the 25mm ocular) and 70x (when the 10mm eyepiece is employed) and an excellent instruction manual written by an experienced astronomer to show you how to set up the telescope properly, as well as guidance on how to keep the optics in tiptop condition. All good starter ‘scopes need a good instruction manual. The Orion SpaceProbe 3 is the latest incarnation in a long line of Newtonian reflecting telescopes, so called because its ingeniously simple design was invented by Sir Isaac Newton around 1668. Over the years, the Newtonian telescope has been steadily improved and refined so much so that today it is arguably one of the most popular kinds of astronomical telescope on the market. Generations of skygazers have enjoyed the crisp, bright images served up by these telescopes, allowing them to conduct detailed observations of a wide range of celestial real estate, from the Moon and the the bright planets, to pretty star clusters, nebulae and distant galaxies in the depths of space. The optical tube displays the basic optical information of the telescope, including its aperture (76mm) and focal length (700mm). The Space Probe 3 telescope has a focal length of 700mm and we need to know this number in order to calculate the magnification being used with any given eyepiece. Fortunately, it’s a simple calculation; just divide the focal length of the telescope by the focal length of the eyepiece. So the 25mm ocular produces an enlargement of 700/ 25 = 28x and the 10mm eyepiece provides a power of 700/10 = 70x. Although these will give very pleasing views at ‘low’ and ‘medium’ power, one will eventually need to stretch the magnification some more to get the best views of high resolution targets like the Moon and bright planets. Furthermore, by dividing the focal length by the aperture, i.e. 700/76, we obtain a quantity called the focal ratio of 9.2 or f/9.2. The significance of this number will become important as I elaborate on the optical quality of the telescope in due course. My field testing over the last two months has clearly shown the potential of this little telescope. A good instrument ought to garner sharp images at powers of 50x per inch of aperture. So according to this reasoning, a 3 inch reflector ought to handle 150x. But I can assure the reader that this telescope can handle considerably higher powers and these high powers can prove very useful for certain kinds of astronomical observations. I have used the instrument profitably at powers of 210x or more but one must also bear in mind that as one pushes the magnification to these high values, the images become rather dim owing to the small 3 inch mirror gathering the light. By far the most economical way to achieve a greater range of magnifications is to invest in one or two Barlow lenses. Typically they will boost the power of any eyepiece by a factor of anywhere from 1.5 to 3 times. You can get a decent Barlow for just a few tens of pounds (it’s always worth watching out for one on the secondhand market too) and when skillfully chosen, can turn two eyepieces into four or even six. For example, a 2x Barlow will enable the two eyepieces supplied to give additional powers of 56x and 140x. For this particular study, I employed 2.25x and 3x Barlows, providing high powers of 158x and 210x, respectively, when coupled to the 10mm eyepiece supplied with the telescope. The eyepieces and Barlows used with the telescope. From left to right: the 25mm ocular, the 10mm ocular, the 2.25x and 3x Barlow lenses. One of the most attractive features of the telescope and its mount is its overall weight; just 8.4 pounds (3.8 kilos)! That means that most anyone can move the fully assembled instrument about. The lightweight, but strong aluminium tripod can be collapsed or extended for seated for viewing or by standing. I decided to use the instrument without its accessory tray so as to maximise the stablity of the tripod. In addition, I elected not to attach the slow motion control bar. This is a strategy I have adopted for many years now, as I like to keep the up−down (altitude) and sideways (azimuth) motions to be as free as possible whilst in ue. With many hours of practice, I have learned to nudge the telescope along smoothly and with minimal vibrations, even at high power. I accept that this is essentially a learned skill and that others may not be happy with it. Only time spent at the telescope can ultimately sway you in one direction or another, and I would encourage as much experimentation as possible in this regard. To get the very best images out of this telescope, the user must ensure that the optics are accurately aligned. The user manual with the supplied collimation cap and Philips screwdriver will enable you to accurately execute such a task. Experience shows that once this is done, the telescope retains very accurate optical alignment, even after being moved from indoors to the outside many dozens of times. This fine tuning of the optical train will make a noticeable difference to the high power views especially. By and large, telescopes are not status symbols. How they look counts for practically nothing in the scheme of things. That said, this telescope is well made and is handsomely finished. It ‘looks’ like a ‘proper’ telescope and performs like a ‘proper’ telescope. The rolled aluminium tube is finished in an attractive British ‘racing green’. Some readers concerned more with appearances than anything else (an ugly reality for some, unfortunately) will no doubt fuss over whether or not it ‘looks the part’ and may falsely ascribe importance to what ‘others’ might think. This rather sad state of mind can be entirely dispensed with however, when one realises that amateur astronomy is very much a small ‘goldfish bowl’. The vast majority of folk I have shared my telescopic experiences with know next to nothing about telescopes and can’t discern anything from its appearance. Indeed, you’re as likely to find a telescope like this in a New York penthouse balcony than in a tenement of a working class community. Telescopes are just not like cars! So, if you’re concerned about something as trivial as ‘looks,’ you’re probably in the wrong hobby! To get an idea of how good the optics are in these telescopes, it pays to take the instrument out during daylight hours. I like to observe nature with as many of my telescopes as possible and usually select a good spot in my garden, out of direct sunlight, and give the instrument a few minutes to settle down in its new environment. To work at its best, any telescope must be allowed to equilibrate with its ambient environment. Failure to do so will provide less than optimal (read disappointing) results, especially when the telescope is ‘pushed’ to high magnifications. I recommend starting with the lowest power eyepiece; this will be the 25mm Explorer II ocular supplied with the telescope delivering 28x. I usually select a distant tree top a few hundred yards distant or some such which I can zoom in on. Care must be taken to avoid observing targets over possible heat sources, such as rooftops and the like. Once a suitable target is chosen, crank up the magnification gradually, carefully touching up the position of best focus by moving the drawtube housing the eyepiece slowly back and forth until the sharpest possible images are produced. Good focusing is an essentail skill, especially when attempting to ‘push’ the magnification of the telescope. By engaging in such an activity, I have discovered that the telesope can take high powers in its stride. The images remain crisp and sharp right up to 210x and beyond, especially on bright sunny days. This comes at the expense of image dimming though; higher powers yield progressively dimmer images. This image quality is no doubt facilitated by the high focal ratio of the telescope (f/9.2 in this case). When the focal length is long in comparison with the aperture of the ‘scope, geometrical aberrations are minimised; less field curvature, coma, distortion, spherical aberration, astigmatism etc. This alows for the use of simpler and less expensive eyepieces so that using the telescope will not create a ‘black hole’ with your resources. In this way, you will discover that this telescope is a very sharp shooter that will embarrass owners of much more expensive telescopes of comparable aperture. The images you will enjoy are true and honest; a simple consequence of the laws of optics and good execution. Here’s an image taken my the US−based amateur, Joe Roberts, who took the time to image the first quarter Moon at prime focus (be sure to click on the image for a good close up) with the same telescope albeit on a sturdy motorised equatorial mount. I hope you will agree that this little telescope is no toy! More a hindrance than a help: the EZ finder that comes with the telescope. One of the Achilles’ heels of this telescope package might not be uncovered until one spends a good few hours in the field. Specifically, many decent−sized telescopes come with the equivalent of a ‘rifle sight’ or ‘finder’ telescope, which usually attaches to a bracket found on the top of the main telescope, adjacent to the focuser draw tube. Once aligned with the main telescope, it serves as a very useful tool to find and centre objects quickly. But the ‘finder’ supplied with the Orion SpaceProbe 3 is not a telescopic ‘finder’ as such, but a non−magnifying device (the EZ finder) that projects a small red dot onto a plastic screen which the user is required to co−align with whatever object is to be observed in the telescope. However, a few sessions of active use with the EZ finder will convince most of its inadequacy. For one thing, the EZ finder can only be used with the brightest stars and for those who live in towns and cities, where light pollution may be a concern, using it will prove more an exercise in frustration than anything else. For this reason, I would strongly recommend the user swap this device out for a regular finder telescope; a small traditional finder ‘scope magnifying perhaps five or six times and having an objective (front lens) of about 30mm. These can be purchased on the used market for very little money. Indeed, if you play your cards right, you may find a sympathetic amateur who will provide you with one for free! Mounting such a finder ‘scope will greatly enhance the enjoyment one can have with the telescope. You’ll be able to focus in on much fainter targets, and learn how to ‘star hop’ from one object to another. Before you can use the finder, it must be aligned with the main telescope. This is easy to do in daylight. Just select a distant target (as far away as posible and at least a few hundred yards in the distance) and centre it the main telescope. Now look through the finder ‘scope and move the cross hairs of the finder so as they coincide as precisely as possible with the image in the main telescope. This is usually done by tigtening or loosening a set of screws in the bracket mounting the finder. Once that’s done, move the telescope to a different target and check to see that the subject you have centred in the main instrument is also centred in the cross hairs of the finder ‘scope. If so, you’re ready to rock ‘n’ roll! The position in which the observer looks into the telescope has a direct bearing on viewing comfort. And the more comfortable the telescope is to use, the more you will use it. In this capacity, the convenient location of the focuser drawtube makes it easy to observe objects situated at low altitudes but it is while viewing targets high in the sky that the great utility of the Newtonian design shines through. As a former refractor enthusiast, I certainly do not miss the extraordinary degree to which one has to crouch down into very uncomfortable positions near the ground in order to view a high altitude target for any length of time. The simple truth is that Newtonians dispense of much of this hardship. Because I value my back and my posture, observing with the Orion Spaceprobe 3 provides a good way forward. Every budding telescopist needs a guide book of sorts. It can be hard to know what’s what, observing from a bright, suburban sky, and from a dark site, where the full glory of the heavens is manifested, it’s very easy to get confused. That’s where a simple guide to the night sky is so useful. It will be prove indispensable as your knowledge and observing skills develop. There are many good literary guides available to the modern amateur. 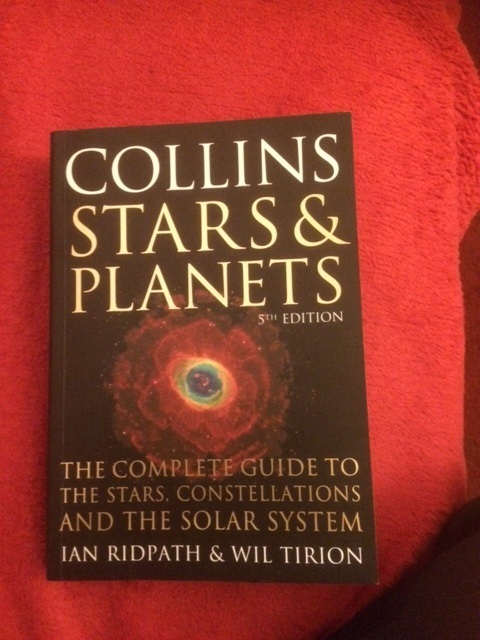 I especially like Ian Ridpath and Wil Tirion’s Stars & Planets (Collins 2017). It’s strength lies with its simplicity. You can use the seasonal and monthly maps to find the outline of a constellation you wish to explore and then home in on your selected target(s) for the evening. The lunar maps are very good too. Overall, I have found it an invaluable aid to small telescope forays in the northern hemisphere, but is equally at home under an antipodean sky. Finally, though it may seem a bit old fashioned nowadays, I recommend that all observers adopt a culture of regularly recording the sights and sensations one experiences while at the telescope. Notes are an important thread to the past. It’s amazing how much one forgets as the years go by, and it is so reassuring to have the means of consulting earlier work in matters that may prove important at some later time. OK. With all that said, we’re now ready to begin an adventure together under the stars, exploring something of the extraordinary riches of the heavenly creation. It is fitting to begin this journey with the brightest and most accessible object in the night sky; our glorious Moon. Oona: a perfect ‘scope for moongazing. Conditions: Clear, bright sky, very little cloud, bright full Moon. Tonight is a Super Blue Moon. This means that the Moon is bigger and brighter than average (that’s the ‘super’ bit). It is also the second full Moon in the month (making it’ blue’), the last one occurring on January 2nd last. Inserting the 25mm Explorer II eyepiece and focusing the telescope shows a big bright orb. Indeed it’s almost dazzlingly bright, prompting some observers to reach for a neutral density filter to cut away some of the glare and reduce eye strain. Notice also that the reflected light from the full Moon makes the background sky very bright, drowning out the light of many of its fainter stars. Did you notice that the image of Moon is both upside down (meaning north is at the bottom and south is at the top) and back to front (meaning east and west are the wrong way round)? All of this is completely normal with a Newtonian telescope. Indeed, spatial orientation is of little importance in the pursuit of astronomical bodies. You’ll soon get used to it! Now, looking at the Moon itself with the 25mm eyepiece delivering 28x. Notice how big the entire field is. Indeed, you can easily see that it will fit about three full Moons from one side to the other. Since the full Moon subtends an angular size of about half a degree on the sky, this gives you an idea of how large the field is in the 25mm Explorer eyepiece; about 1.75 degrees. That’s plenty big enough to see the vast majority of deep sky objects, as we shall see on other evenings. Chances are you’ll have also witnessed two ray craters on the lunar surface. Down near the bottom of the Moon (as you observe it in the northern hemisphere) is Copernicus and the one near the top is called Tycho. Can you see how rays of bright matter seem to stream from these craters? The rays are caused by ejected material gouged out when a large, rocky body collided with the lunar surface in the distant past, ejecting huge quantities of material away from the crater and in all directions (that is, radially). Such ray craters are very old: Tycho is believed to have formed some 100 million years ago, while Copernicus is thought to be 10 times older still (so a billion years or so). The two prominent ray craters visible in the telescope; seen here in the correctly orientated view. Because your telescope is a reflector, it shows the true colour of the lunar regolith. Looking closely at its surface will convince you that it has many shades of white and grey, revealing something of its mineral content and age. Next, remove the 25mm eyepiece and replace it with the 10mm. After centering the Moon and refocusing; you will note that the field of view is considerably smaller and yet it’s still larger than the size of the full Moon. Indeed, this 70x eyepiece serves up a fairly generous field of view of about 0.7 degrees. It follows that as the magnification increases for a given eyepiece design, the field of view shrinks. This observing session will have familiarised you with the magnifications and field sizes for your two eyepieces. These will be useful data as we plan our observations of other celestial bodies. Alas, observing the Moon while it is full is the absolute worst time to see many of its most inspiring features. To see the great mountains, valleys, craters and rilles; we’ll have to wait until the Moon proceeds through its last quarter and crescent phases. We shall return in a few days when it begins to wane. Be sure to tune in again soon; you won’t be disappointed! Conditions: good, steady conditions, almost totally clear, cold. I’ve been watching the Super Ball! It’s a lovely winter night here in the glen. The Moon began to rise about 10:30pm local time, but I waited a couple of hours before beginning observations of the waning gibbous Moon. Charging the telescope with the 25mm Explorer eyepiece, I watched in sheer amazement as our wonderful natural satellite rose above the tree line in the east. Even with the 28x eyepiece, there was a wealth of fine detail to be seen. At low altitudes the air roils quite a bit. That’s totally normal. At low altitudes, you are looking through a dense swathe of air, which generates a bit of turbulence. At these low altitudes, you can even make out subtle colour differences in the lunar regolith. Specifically, the Moon takes on a very light, rose tint. This is also to be expected, as at lower altitudes there is more dust which scatters blue light more than red (a phenomenon called Rayleigh scattering). I find it very beautiful! Compare its colour again when it rises a lot higher in the sky. That comely rose tint all but disappears. Only its silvery face presents itself when it rises above the dust line. Below is an image of how you should see this waning gibbous in the low power field of your 3″ reflector. I simply rotated and inverted a Wiki Commons image of the Moon at this stage in its phase. That said, I perceive the contrast in the telescopic image to be noticeably better than this image. The waning Gibbous Moon as seen in the low power eyepiece of the telescope. As the minutes pass, the Moon rises higher and the image becomes steadier. When it reaches a decent height, say 15 degrees or so, remove the low power eyepiece and insert the 10mm ocular, delivering 70x. The image should remain nice and crisp and even more detail should be discernible. Use a Moon map to try to identify some of the sights your eye meets with. As the Moon rises above 30 degrees altitude (so about one third of the way from the horizon to the zenith), use a Barlow lens to boost the power still more. If the optics are working half decently and are properly aligned, you ought to get good sharp images at 150x or higher, if the air remains steady. That the images are crisp and clean even at these high powers testifies to the extraordinary value of this economical little telescope. Intriguingly, February 2018 will not have a full Moon (it will be almost full though lol); something that hasn’t happened since 1999. And, as if in recompense, March 2018 will have two full Moons; one on the 1st and the other on the 31st. So March 2018 will present another Blue Moon if you’ve missed the apparition in January. I like to name all my telescopes. This little one is called Oona. Wee Oona; ready for action. If you follow the phases of the Moon faithfully with the little Space Probe 3 telescope, you’re sure to have an absolute ball. It will serve up beautiful images time and time again. Arguably the best times to observe our natural satellite is between the half−illuminated and crescent phases. You will be astonished at just how much this instrument can reveal! When taking the telescope and your eyepieces from the cold night air back inside to a warm indoor space, chances are you’ll notice that some condensation may form on the optical surfaces, in much the same way as steam from a kettle fogs up a cold window. This effect of fogging up is more inconvenient than anything else, but you can largely avoid it by capping your eyepieces and the telescope before you bring them back indoors. Under no circumstances are you to rub the lenses or the mirrors while they have dew on them. If you see signs of condensation, just let it evaporate away before capping up the optics. These simple measures will ensure that your equipment will remain in top condition for many years to come. Observing the Moon is only the first step in enjoying the Orion SpaceProbe 3. As we shall discover, a rich variety of celestial objects are within easy reach of this little telescope. All we need is another clear sky to explore them. The Northern sky on February evenings. The night sky is constantly changing; minute by minute and hour by hour, as the world turns on its axis and races around the Sun. Consulting the all−sky maps presented on pages 30 and 31 of Ridpath and Tirion’s book, you can see how the February sky appears in the northern hemisphere. Looking south, we see Virgo, Leo, Cancer, Gemini and Taurus, as if in some grand procession, moving from east to west. Concentrating on the constellation of Cancer, the celestial Crab, featured on page 97, I have selected a single object worth investigating with the telescope; The Beehive Cluster (M 44). The constellation of Gemini in our guide book. M 44 is seen circled near the centre of the consellation. The accompanying notes featured on page 96 give us enough background information in order to make sense of what the telescope will reveal. M 44 is an open cluster, also known as Praesepe (the Manger), the authors inform us. It is large, covering about 1.5 degrees, and consists of some 50 stars ranging in glory from magnitude 6 and fainter. It even tells us how far away the cluster is; a mind−boggling 592 light years according to measurements made by the Hipparcos satellite. It ought to be visible to the naked eye as “misty patch” from a dark country sky, making it easy to track down. I took the telescope out for a short spell tonight after work. It remained very clear all day, and on into the evening. It was another lovely vigil with a light dusting of fresh snow to brighten up the landscape. So, before the Moon came up, I ventured out when I knew the cluster would be highest in the sky, that is, when it’s due south. Where I live, M44 is a very easy naked eye object. Just like the authors described, it’s a fairly conspicuous “misty patch” that is easily framed in the finder ‘scope and the main telescope proper. Only one eyepiece was used tonight; the 25mm Explorer II, delivering 28x. It framed the cluster perfectly, where dozens of stars of various degrees of glory pepper the field of view. And it’s not at all hard to see why its more popular name, the Beehive Cluster, is alive and well. With a little concentration, you can make out a soft, yellow colour in the brighter members; a good sign that this cluster is fairly mature in the scheme of things. I made a simple sketch of what it looked like (see below). If you are warm and comfortable, sketching can be a whole lot of fun, even in the cold of winter. I simply try to memorise what the field is like for 10 or 15 minutes, nudging the telescope along with one finger as the Earth rotates beneath my feet. Once I’m indoors I make the sketch. Little Oona frames lots of things in the sky very well. There are, of course, other ways to make a sketch. Many do so while at the telescope. In order to do that, it’s advisable to protect your night vision as much as possible. You see, in the dark, your pupils dilate to take in as much light as possible. This is a natural biological response to low light conditions. Fortunately, red light does not appreciably interfere with this dark adaptation, and so many amateurs choose to make their telescopic sketches of deep sky objects under the illumination of a low intensity red light source. Whatever way you choose to carry out your sketches, I hope you will find the activity both relaxing and rewarding. An OSLO analysis of a perfect 76mm f/9.2 spherical mirror. The reader should concentrate on the red underlined data in the lower box. If your mirror is a perfect sphere then you have a wavefront rating of 1/12.5 PV. Put another way, a completely error free mirror with these specifications would have a Strehl ratio (seen on the right above) of 1.0. The analysis shows that the actual value is shockingly close to absolute perfection: 0.97! The conclusion is very simple to interpret: small aperture and long focal length spheres are so close to a parabola it makes little difference. Of course, we also need to consider the aberrations introduced by the secondary mirror, but suffice it to say that unless the secondary is a complete lemon, it’s very likely that the overall quality of the optics will be very high indeed, good enough to impress anyone who takes the time to spend a few hours with it. Star testing provides a good way to test how well the optics behave in the field. To do this, make sure the telescope has accurately aligned optics and has had time to cool down outside. Next, select a bright, first magnitude star, situated high up in the sky. For example, Capella is just perfect from my far northerly location. Select a high power; anything between 100x and 150x and carefully focus it. You ought to see a tiny sphere (the so called Airy disk). The Orion Spaceprobe telescope supports the secondary mirror using a 3 vane spider (b above) and yields six diffraction spikes that are very hard to see except round the brightest stars. Now, if you slowly rack the focuser inward, you will begin to see a set of concentric, Fraunhofer diffraction rings around a dark central spot.The shadow of the three spider vanes will also be seen. And when you then rack the focuser outward, past the position of precise focus, the diffraction pattern should look identical (or almost so). This is what you want to see in a telescope offering very good to excellent optics. Star testing can provide much information about your telescope, but it’s always best to conduct such tests under the best conditions your local environment will provide, and (preferably) over a few nights. If you don’t get such textbook perfect results, don’t fret. I mean, if you’re already happy with the high power images your telescope is serving up during the day, and again by night, you have a winner and you needn’t worry any more. Oona star tests very well, showing that her optics are of very high quality. Mass production has clearly come a long way with these little telescopes! Orion is a majestic constellation to explore with a small telescope. It was a bright and clear day today and the the sky has remained largely cloudless after dark. The mighty constellation of Orion the Hunter is now approaching its highest point in the sky so is nearly due south. It will present a good opportunity to examine an entirely different kind of deep sky object. Tonight, we will pay a visit to the Great Nebula in Orion. Our guide book on page 197 shows me exactly where to look: immediately beneath the middle star in the Hunter’s belt. The notes of page 198 inform me of some sensational facts about this target; the object, known also as M 42, is a gigantic ball of gas lit up by young stars that are forming inside it. The authors say M 42 lies about 1500 light years away and that it is almost 20 light years across, and much more. Time to set up the telescope once again for another adventure under the stars. The Great Nebula in Orion is also easy to spot with the naked eye. A couple of seconds of scrutiny will convince you that it is quite unstarlike; more like another ‘misty patch’ than anything else. Starting with the 25mm Explorer II eyepiece, the telescope clearly reveals its nebular nature in a pretty hinterland of bright stars. If you carefully focus on the nebula, the same eyepiece should allow you to just make out four distinct stars at the centre; this is the famous Trapezium; very young and hots stars that are estimated to be only a few million years old. They formed out of the cool gas that surrounds them. Ordinarily, a gas cloud is not luminous in and of itself. It is only by virtue of the radiation from the stars that form inside it that renders it visible, just like a neon light bulb. Now switch to the 10mm Explorer II ocular for a better view of this magnificent structure. At 70x, it is much easier to see the four stars making up the Trapezium, as well as much greater detail in the nebula itself. My eyes can clearly discern colour within the nebula; a very pale green. The colour becomes easier to discern as one’s eyes adapt to the darkness. The visual colour of M 42 is quite unlike that produced by a CCD camera however, which picks up vivid blues, pink and red, owing to its greater sensitivity to light. Still, just detecting some colour provides a real visual thrill. Just to the north of M42, my eye meets with a ‘fuzzy’ star. This is in fact another nebula; M 43. After several minutes of study, slowly nudging the telescope along as the object moves westwards through the field, I made a quick sketch of my impression of the view as seen through the little 3″ reflector. M 42 as observed on the evening of February 9 2018 using the 76mm f/9.2 reflector. South is at the top and west is to the left. Larger telescopes will give even more compelling views. That’s because larger telescopes collect more light and deliver that light to your eyes. A fully dark adapted human eye allows your pupil to dilate to about six or seven millimetres. That is the maximum ‘aperture’ of the human eye. But when you look through the telescope, that 7mm is replaced by a mirror fully 76 mm in diameter! As you can imagine, it collects many times more light than you can with your naked eye because its light collecting area is so much greater; and that allows you to see much fainter objects. The orion SpaceProbe 3; a wonderful little light cup. Conditions: turbulent, frequent sleet & snow showers, very cold in the wind. Oona(right, background), accompanied by Octavius, my newly flocked and insulated 8−inch f/6 Newtonian reflector. I spent Saturday afternoon lining the inside of my 8 inch f/6 Newtonian reflector with cork and then covered it over with flocking paper. This evening, I decided to test drive the 8 inch, which I had planned to use along side the 3 inch reflector, but the frequent interruptions from snow showers forced me to retire the larger instrument after about 15 minutes; I did however gather some useful data on a few tricky double stars. Because the 3 inch telescope is so lightweight and ultraportable, it was the ideal instrument to use in these very mercurial conditions. And it allowed me to greatly extend my gaze. Everything we have visited thus far with the 3 inch reflector lies entirely within our own galaxy, the Milky Way. Tonight though, I spied the Plough asterism looming large in the northeastern sky and decided to try my hand at tracking down the famous Messier duo, M 81 & M 82; a wonderful pair of galaxies located at a distance nearly four orders of magnitude further away than even the Great Nebula in Orion! The pair is easy to track down in a dark, moonless sky. Consulting my guide book on page 251, I was able to chart a course for these fairly easily, by drawing an imaginary line from Phecda through Dubhe, and extending that line about twice as far again until I arrived at my destination. Tucked away in an otherwise fairly barren sector of the firmament, my finder could easily make out 7th magnitude M 81, and, with a wee bit more concentration, M 82 also. Once again, only one eyepiece was used this evening; the trusty 25mm Explorer II eyepiece, which easily framed the duo, separated as they are by about 0.6 angular degrees of sky. M 81 looks fuzzy and elliptical in shape, brightest near its centre and gradually fading towards its edges. M 82 to its north presents as completely different however; more cigar shaped than elliptical. After a while studying the pair, you may come away thinking that M 82 is easier to study, even though it is about four times fainter than M 81. Both galaxies lie at a distance of 12 million light years; an utterly unfathomable scale. I made a quick sketch, shown below, of M81 and M 82, and its hinterland through the SpaceProbe. Messier 81 & 82, as seen through the 3″ f/9.2 reflector on the evening of February 11 2018. There are many more galaxes within reach of the little achromatic, and which will take us even further afield. Best to wait ’til better weather sets in though. Conditions: Mostly clear, some cloud interfering with observations, milder than of late, windy. After enjoying a romantic Valentine’s supper together with my wife, I ventured outside to see how the sky was shaping up, and as luck would have it, it seemed very inviting to continue our adventures under the stars with the Orion SpaceProbe. As promised, we’re going to try our hand at objects significantly farther away than our former targets; specifically, a trio of galaxies in the constellation of Leo the Celestial Lion, which will be very well placed later this evening. These galaxies are located about three times farther away than either M 81or M 82, so about 35 million light years distant from our galaxy, the Milky Way. Our targets tonight are located in southern Leo, shown just above the tip of the pencil in this photo. Consulting my guide book on page 169, I can clearly see the location of these galaxies; M 95, M 96 and M 105; which should be captured in the low power (28x) field of the 3 inch telescope. That said, these ‘island universes’ are considerably fainter than M 81 & M 82 and so will be a bit more challenging to see (my guide book quotes both M 96 and M 105 as having a magnitude +9, whereas M 95 is fainter still at + 10). I shall report back later to tell you how I got on. Fingers crossed! Alas, it has totally clouded over, so I will need to abort this activity tonight and try again another night. The weather is not always in harmony with human ambition. Meteorology may be a mature science, but it can’t yet be relied on with 100 per cent accuracy. There will always be discrepancies between what the forecast predicts and what you actually experience. It just comes with the territory of any amateur astronomer. That said, such episodes cultivate patience and preparedness; virtues in their own right. It is a New Moon today, so a thin crescent should appear in the sky over the coming evenings. But once that Moon sets, it will be good and dark enough to ferret out those galaxies in Leo. I will report back again as soon as an opportunity presents itself. Conditions: quite windy, some clear spells, remaining more mild than of late. I managed a short spell with the SpaceProbe just after midnight. By then, Leo had moved into a favourable position in the south southeast. I centered the finder ‘scope on the star 53 Leonis, which lies just south of the targets in an otherwise rather empty region of sky. Then, charging the 3 inch with the 25mm Explorer II eyepiece, I nudged the telescope about one angular degree to the north norhwest and scrutinised the field for signs of faint fuzzies. Sure enough, both M 95 and M 96 show up well in the little SpaceProbe at 28x. The more easterly M 96 is slightly brighter than M 95. The latter appears rather circular with a noticeable central condensation. To my eye, the fainter M 96 looks a wee bit more elongated along its north−south axis. Both of these objects are classed as barred spiral galaxies. Moving this pair to the southern edge of the field, your eye will pick up the giant elliptical galaxy M 105, appearing as a faint glow. Although the strong gusts of wind and the constant interruption from clouds prevented me staying out for very long, you can visit another delightful trio of galaxies directly east of these objects; specifically M65, M66 and NGC 3628, also featured on the map above. All shining with magnitudes of about 9, they present as an equally challenging target for the 3 inch reflector. Do give them a visit if your skies permit. We’ve only just begun to sample the riches of the deep sky with the 3 inch reflector. By studying the maps provided in the guide book, you can explore many more, and all in their due season. The more you use the instrument, the more proficient you will become at finding these objects in the night sky. I would now like to call your attention to an exceedingly rich cache of double and multiple star systems that can be studied with this little reflector. These objects are a particular favourite of mine, so I hope you will indulge me a little. The world of double and multiple star systems. On page 282 & 283 of our guide book, the authors discuss these fascinating objects. Our star, the Sun, is alone, but many stars in the firmanent, perhaps the majority, occur in so−called binary or multiple star systems, where each component is bound up by the gravitational attraction of its other stellar members. A few, as we shall discover, are not true binaries at all. They just happen to be situated very close to each other from our vantage but are not actually physically connected. Such targets are called optical doubles. Like the many other classes of deep sky objects, double stars come in a variety of levels of difficulty; from the easy to difficult. Fortunately, the easiest double and multiple stars to see through the Orion SpaceProbe are also amongst the most beautiful. If the weather cooperates this evening, we’ll take our first steps into this fascinating sub−discipline of amateur astronomy. Diviner of double and multiple stars. Conditions; Cold, partially clouded over, decent clear spells. I managed a few simple drawings of some double and multiple stars near the north ceslestial pole. I had intended to sketch Castor A & B but was clouded out before getting to it. I will discuss these systems later. Some simple sketches of double stars in and around the pole. The above drawings reveal some easy double and multiple star targets near the north celestial pole. Where I live at 56 degrees north latitude, all of these systems are within easy reach, owing to their high altitude. Mizar is the middle star in the Plough handle, now situated high in the eastern sky. Closer naked eye scrutiny reveals that it has a fainter companion, but you’ll get a very pleasant surprise when you examine the system telescopically. For this you will need to use the 10mm eyepiece (70x) as indicated in the sketch, but you should clearly see that Mizar itself is also double! It is without doubt one of the northern sky’s most celebrated double stars. Curiously, astronomers have discovered that although they appear to be co−located, there is no physical connection between them. Indeed, on page 252 of our guide book, Mizar is found to be 86 light years away and Alcor just 82 light years distant. Thus, we are looking at an optical double here. However, the close−in companion to Mizar is a bona fide companion. This was the first telescopic double ever to be discovered in the history of astronomy, being first sighted by Giovanni Riccioli in 1650. In my sketch I have also recorded the faint star with a very lofty sounding name, Sidus Ludovicianum, situated between Mizar and Alcor. It is of note only because an intrepid 18th century German stargazer believed it was a new planet and, as was the custom in those days, named it after Ludwig V, his monarch. Polaris, the pole star, is a completely different animal though. In the low power (25mm) eyepiece, it appears as creamy white star, but if you crank up the power to 70x or higher and closely scrutinise the space in the immediate vicinity of the star you will eventually notice a tiny, faint spark over 250 times fainter than the main star! You might want to increase the power that little bit more with a Barlow lens in order to see it even more distinctly. This is another true member of a gravitationally bound multiple star system, the other constiuents being too difficult to pick up in the little 3 inch reflector. Polaris A and B lie at a distance of 433 light years according to our guide book. Interestingly, Polaris A is a giant pulsating star known to astronomers as a Cepheid Variable. By studying this class of star, astronomers were finally able to elucidate the vast distances to the nearby galaxies beyond the Milky Way in the early decades of the 20th century. Note: did you notice Polaris moves much more slowly in the telescopic field? Puzzled? Well, that’s because it lies less than one angular degree from the north celestial pole, the rotation axis around which all the stars in the northern hemisphere appear to whirl. This rather convenient position means it is so much easier to study using the undriven mount of the SpaceProbe 3. Moving into Canes Venatici (see page 99 of the guide book), yet another showpiece double is ripe for viewing. The brighter member appears white to the eye at 158x and the fainter looks more electric blue to my eye, though reports differ significantly between observers. Indeed, no two observers will report precisely the same colours! This system lies 115 light years away. Conditions: Cold, hazy skies, good seeing. I had to tie up some loose ends and couldn’t come back to this as early as I had planned, but I made up for it somewhat this evening. Below are two further sketches I made at the eyepiece of the Orion SpaceProbe 3. The first is Castor A & B in Gemini. Using the map on page 153, I was easily able to pinpoint Castor high in the southern sky at 22:00UT. Centring the star in the 25mm eyepiece, I switched to the 10mm and was delighted to see that even at 70x, the components were well split. But you’ll get a much more majestic view if you crank up the power still more, and, like I said before, this telescope takes high power in its stride because its optics are very good indeed. If your sky is good, test it at 210x and I guarantee you’ll be gobsmacked by what you see! Both Castor A & B appear pure white as the driven snow, and are quite close together; significantly closer than any system we have thus far visited. More on this tomorrow. An observation of the close double star system Castor A & B, as seen on the evening of February 22 2018 through the 3 inch Orion reflector. As the night marched on, the skies became steadily more hazy and visibility suffered as a result. But I spied Leo coming into a good position in the southeastern sky. Using the map on 169 of our guide book, I was able to pinpoint the fairly bright star gamma Leonis (or Algieba, in Arabic parlance) and after centring the star in the 28x field, I one again cranked up the power to 70x and was delighted to see that, like Castor A and B, it too was duplicitous. The brighter member (primary) shines with a golden countenance, while the secondary component appears yellow−green to my eye in this telescope. They are exceptionally handsome in the instrument at 210x. The system lies about 110 light years away and our guide book informs us that they orbit their common centre of gravity in just over 500 years! I made a sketch of this system too in the high power field of the 3 inch reflector, pictured below. An elegant communion of suns, courtesy of your Creator. Perhaps you noticed that in the high power field of 210x, both Castor A & B and Gamma Leonis appear to be separated by about the same angular distance. Just how close they are will be the subject matter of my next discussion. A word on the stellar magnitude scale: The stars in our guide book are divided up on a scale of magnitude, first devised by the 2nd century BC Greek astronomer, Hipparchus. He found it convenient to divide up the glory of the stars into six magnitudes, ranging from the brighest stars (magnitude 1) down to the faintest (magnitude 6) stars that could be seen with the naked eye. This rather arbitray assignment of brightness was improved on in the middle of 19th century of the common era, when the English astronomer, Normon Pogson, defined magnitude 1 stars as being precisely 100 times brighter than those of magnitude 6. Roughly speaking, a first magnitude star will be about 2.5 times brighter than a 2nd magnitude star, and these in turn are 2.5 times brighter than stars of the third magnitude, and so on. On this scale, there are stars that are actually brighter than magnitude 1 and are assigned either magnitude zero or a number less than zero. For example, the brightest star in all the heavens is Sirius, shining with a brightness of −1.46! This scale has the advantage of being able to be extended in both directions; brighter objects take on a greater negative magnitude, while stars fainter than magnitude 6 are assigned brightnesses with greater positive values. In this scheme of things, the Sun shines with a dazzling brightness of −26.7! Our guide book depicts stars of varying brightness with different sizes, going from the largest (brightest) to the smallest(faintest). Angular measurement as it applies to double stars: As mentioned yesterday evening, the Orion Spaceprobe 3 showed us stars that were separated by various amounts of dark space. To see how close these separations are we must first take note of how angles are measured in astronomy. Recall the full Moon in the sky. This conspicuous orb subtends an angle of 0.5 degrees, but when we spied the small list of double stars discussed above, the telescope was able to resolve things separated by much smaller angles. For convenience, one angular degree is further divided into 60 arc minutes, so using this scale, the full Moon spans 30 arc minutes. One arc minute is depicted as 1′. Now each arc minute, in turn, is further divided into 60 arc seconds (depicted as 60″). So 1.0 degree = 60′ = 3600″. Using this new scale, we can begin to explore how much the stars in the above sketches are separated by. The companion to Mizar, for example is separated from its primary by 14″, but the two tightest pairs thus far examined; Gamma Leonis and Castor A & B have much smaller separations; of the order of just 4″ or so. But just how much finer can our little telescope resolve? For double stars, we have a well established rule of thumb devised by the Victorian mateur astronomer, William Rutter Dawes, who suggested that the the limit is given by the simpe formula called the Dawes Limit: 4.56/ D where D is the aperture of the telescope in inches. Thus, for the 3 inch SpaceProbe, we ought to be able to resolve pairs separted by as little as 4.56/3 = 1.5″. The reader will note that as the diameter of the telescope is increased so does its resolving power. A 6 inch aperture ought to resolve pairs roughly half as small again. There are a few qualifications we have to make with this formula. For one thing, Dawes devised it for two 6th magnitude stars of equal brightness. Things get more difficult as the brighness difference between the components becomes greater. Simply put, the greater the difference in brightness, the greater the angular separation needed to resolve them. What is more, if the stars are blue and equally faint, separations a little smaller than 1.5″ becomes possible. What’s more, the small obstruction made by the telescope’s secondary mirror (which we learn is just 19.9mm as stated on page 8 of the telescope instruction manual) also tends the shift the maximum resolving power a little upwards to more than 1.5″. Finally, these considerations are strictly true only for resolving stellar targets; as we shall see, the telescope will be able to resolve considearbly finer details on extended objects like the Moon and planets. Small telescopes such as the Orion SpaceProbe 3(laevo) and the Shortube 80 make dapper double star ‘scopes. The Moon is now at first quarter and very high up in the southern sky. This is an ideal opportunity to see just how well the little Orion SpaceProbe 3 can perform. After examining its surface at 28x and 70x, feel free to crank up the power to 150x or 210x and note how well the image bears up. Right now you will see amazing details in the crater fields, the Apennine Mountain range and much much more. It’s at times like this that you will come to appreciate just how good this telescope is. Enjoy the ride! It was a beautiful bright day here in the glen but it remains unusually cold. After a very hazy night last night, transparency improved a great deal today and I set up the little telescope at sunset to enjoy wonderful details on the brightening Moon. Seeing remained exceptionally good, as evidenced by very steady high power views of the Moon and double stars using a couple of larger telescopes I had also deployed to make the most of the unusually good conditions. Beginning at about 6:45pm local time, I began to make observations of three rather delicate stellar systems; Rigel (Beta Orionis) easily seen as the exceptionally bright white star in the extreme southwest of the constellation. The SpaceProbe showed its very faint companion just off to the southsouthwest of the primary. Although I caught a glimpse of it at 70x using the 10mm Explorer II eyepiece, I elected to boost the power to 158x using my 2.25x Barlow lens and was rewarded with an even better view. Although Rigel B is situated about 9″ away from its primary, the enormous brightness differential makes it far more challenging than it looks on paper. Immediately after that, I moved the telescope east into Monoceros (featured on page 187 of our guide book) by using Orion’s downward sloping belt stars as a pointer. I quickly centred Beta Monocerotis in the low power eyepiece. Then I switched to 210x by inserting the 10mm ocular with my 3x Barlow and was rewarded by a wonderful sight. Here is a magnificent triple star system (sketched below). The reader will note that the B and C components of this system are just 2.9″ apart, so significantly finer than anything we’ve thus far explored. Another triple system can be found in Cassiopeia (see the map on page 109). You can find it by making an imaginary line from Ruchbah through Eta and extending that line about the same distance again until you come to a creamy white magnitude +4.6 star, Iota Cassiopeiae. Using a power of 210x, the 3″ SpaceProbe showed me an even more beautiful and delicate arrangement of three stars. The C component is easier to see owing to its greater distance from A but the B component is also just under 3″ from the latter. Below are some simple sketches I made for clarity. Observations of delicate multiple stars as seen with the 3″ Orion SpaceProbe on the fine evening of Saturday, February 24 2018. You can take it from me that these systems are challenging for obervers with significantly larger ‘scopes, so I hope you will agree that the 3″ Spaceprobe is a most capable high resolution instrument. Just as I was about to pack up my 8 inch and 3 inch Newtonians at the end of an excellent vigil under the stars at 23:30UT on Saturday, February 25, I spied a couple of stars in Ursa Major, now very high up in the south southeastern sky, indicated by the position of the pencil tip in the image below (page 251 of our guide book). Specifically, I went in search of a star called Xi Ursae Majoris, also known by the rather charming appellation of Alula Australis. After centring the star in the low power 28x eyepiece, I once again cranked up the magnification on the 3 inch SpaceProbe to 210x, carefully focused and was rewarded with a beautiful, sharp image of a pair of yellow suns, the primary shining at magnitude 4.3 and the secondary, just a half a magnitude fainter at magnitude + 4.8. What is MOST interesting about this system is that they are currently separated by just 2″, so we’re getting awfully close to the double star resolving limit of a 3 inch (76mm) telescope. This pair of stars move fairly rapidly, completing one orbit of their centre of gravity in just under 60 years! The reader will also note that this was the first visual double to have its orbit calculated by Felix Savary back in 1828. I made a sketch (below) of what I saw in the SpaceProbe. The stars are orientated roughly north to south. Xi Ursae Majoris; testing the mettle of the little long focus Newtonian. Seeing: Remaining very good, very bright waxing gibbous Moon, virtually cloudless sky. We are stuck in very cold, Arctic−like weather which meteorologists have dubbed, “the beast from the east” lol. At this late hour, the eastern sky is now showing the wonderful Spring constellation of Bootes. This constellation is home to a veritable treasure trove of interesting double stars. The other night, I got my first gander through my larger 130mm f/5 Newtonian of one of my all time favourite colour constrast double stars; Epsilon Bootis, or Izar, discussed on pages 90 though 92 in our guide book. Despite the presence of a very bright gibbous Moon, its shines fairly prominently at magnitude + 2.5, so is easy to find even from an urban location. Bootes is home to some fine double stars, choicest among them being Izar, indicated by the pencil tip in the map on page 91 of our guide book. Shortly after midnight local time, it had a reached a decent altitude above the eastern horizon, so I decided to investigate what was what with the 3 inch telescope. In the low power (28x) field, the star looks singular with a comely orange hue. But when I increased the power to 210x, I was once again delighted to see its greenish companion fairly effortlessly in the fine winter air. Now, while the pair is separated by about 3″, there is a fairly large difference in brightness between the components; the primary being +2.6 and the secondary only +4.8. Thus, there is a 2.2 magnitude differential between the components, making it more challenging than it looks on paper. The Orion SpaceProbe is turning out to be a most excellent double star telescope that even veteran observers will appreciate! I made a drawing of what I saw in the eyepiece for reference (shown below). My sketch of Epsilon Bootis in the high power field of the Orion SpaceProbe 3 telescope. 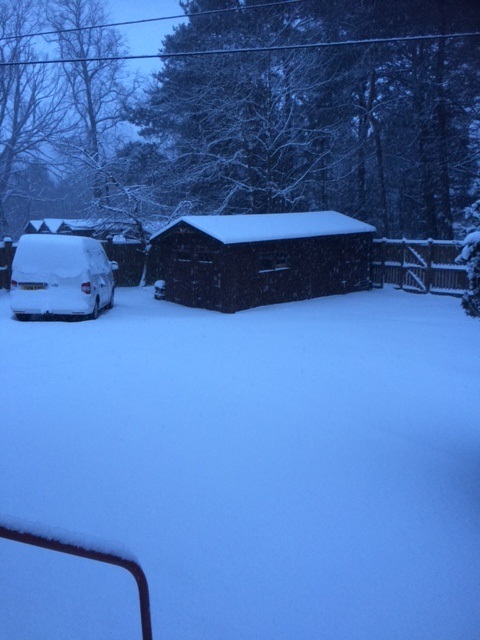 The beast fae the east is here the noo. Shockeroonie! The elements are arrayed against us. We endured freezing, blizzard conditions (the worst in the country) throughout last night, bringing at least 30cm of snow. The high winds have created dangerous drifts of fine, powdery snow, making the roads all but impossible to travel on. But we have a warm fire, plenty of food and water, and our spirits remain high. Small telescopes are very popular choices for observing the Sun, the star that sustains all life on Earth. I thought about how I might use the SpaceProbe 3 to do some solar observing when Spring properly arrives. Two methods came to mind: the projection technique and the use of a white light solar filter. The former involves pointing the telescope, fitted with an eyepiece, at the Sun and using some white card to project a focused image of the solar disk in order that I could record the presence of sunspots(regions of high magnetic intensity on the surface of the Sun). But I didn’t want to risk damaging the telescope with excess reflected heat (even a small aperture telescope like this can generate dangerous levels of heat), so I thought about using a white light solar filter as an alternative strategy. Since I already owned and use an inexpensive white light solar filter with my Shorttube 80 achromat, I wondered whether or not it would fit onto the Spacerobe 3 optical tube. The white light solar filter used with my Short tube 80 achromat fits snugly on the SpaceProbe 3 telescope! Well, it was like finding money in the pocket of an old jacket lol! The filter fitted snuggly over the front of the instrument! It was the perfect fit! Now I can observe the glory of our star in perfect safety. The tall tripod upon which the telescope sits is a good height off the ground, allowing any ground thermals to be kept at bay. This should make an excellent little solar telescope but I shall have to wait until this severe weather leaves our shores before more testing can be done. The filter works by rejecting 99.999 per cent of the incident solar radiation, passing only a tiny fraction of the Sun’s light to the eye. NEVER LOOK AT THE SUN THROUGH ANY OPTICAL INSTRUMENT AS PERMANENT BLINDNESS WILL RESULT! If you plan to use the SpaceProbe 3 to observe the Sun on a regular baisis, it pays to remember that the most economical way of acquiring a solar filter is to make one yourself. There are many outlets that sell various kinds of polymers specifically designed to reject the vast majority of the Sun’s light and heat. Perhaps the best of all is the very well established Astrosolar Material, marketed by Baader Planetarium. You can purchase a sheath of this material for under £20 UK and use it to make your own, homemade filter. Here is a link to one such DIY project. I’d appreciate if someone were to follow up on the reports thus far communicated. It’ll take up a little bit of your free time, but I think you’d get a kick out of it. Well, after a week long hiatus owing to terrible winter weather, the Sun briefly poked its brilliant rays through the clouds and I was finally able to see if the solar filter worked as advertised. I can report that the Spaceprobe 3 did an admiral job of focusing the solar disk sharply using the 10mm Explorer II eyepiece. Because the Sun’s disk is precisely the same size as the full Moon, it takes up the same area of the field.The reader will note that the small finder ‘scope objective was covered during the observation, so as to prevent any potential accidents! See, you have to think ahead when observing our star! Was there anything to see? Though I’m certainly not a diehard solar observer, I’ve never seen it so completely devoid of sunspots! That’s not to say that there are no sunspots on its surface only that they were beyond the detection limits of this small telescope on this occasion. That having been said, there is no reason why a would−be user of the Orion Spaceprobe 3 could not use this as a very effective white light solar telescope; adding to the versatility of the instrument. Curiously, low sunspot activity is somewhat correlated with cold spells, so in a way, this was not completely unexpected. Taking stock: By now, I’ve demonstrated just a tiny number of things in the heavens that are accessible to this excellent little telescope. And the sky’s really the limit! By studying the constelattions that are well placed in your local skies, you could spend many happy months and years exploring a host of other deep sky objects, as well as the glories of the Moon and never once feel you’re missing anything. And once you’re done, you can always visit them all over again, each in its proper season. Soon, you’ll find that they become old friends! Such is the atitude of a determined telescopist! I would like to end this blog by exploring something completely different; a planet dwarfing the Earth in size and majesty, hurtling ’round the Sun beyond the snowline of the solar system. I speak of none other than mighty Jupiter. More on this soon. Comparing the image sharpness and light gathering power of the Orion SpaceProbe 3 with a stopped down 90mm f/5.5 ED apochromat. Introduction: On Sunday afternoon, I set up both the Orion SpaceProbe 3 f/9.2 Newtonian alongside a high quality 90mm ED f/5.5 apochromatic refractor during a bright spell in order to estimate the light gathering power of the Newtonian and also to compare and contrast image sharpness in both instruments. Both telescopes were kept out of direct sunlight, so as to miminise thermal effects. Materials and Methods: I constructed three aperture masks of progressively larger aperture from cardboard. These had diameters of 56mm, 65mm and 73mm, respectively. The masks were affixed using parcel tape, placed ahead of the dew shield of the refractor and carefully centred on the optical train. Starting with the 56mm aperture mask, I compared the images of the denuded branches of a horse chestnut tree about 100 yards in the distance in both telescopes. I charged the ED refractor with a Vixen HR 2.4mm ocular delivering 208x diameters. A 2” Tele Vue Everbrite diagonal (99% reflectivity) was used to maximise image brightness in the refractor. The Orion SpaceProbe 3 reflector was charged with a 7.5mm Parks Gold coupled to a 2.25x Barlow delivering 210x. The experiment was repeated using the 65mm and 73mm aperture masks on the refractor and the views similarly compared. My wife also volunteered to assess the images and our findings were in good agreement. Making the aperture masks: left to right: 56mm, 65mm and 73mm, respectively. Results: There was a clear and unequivocal difference between the images when the refractor was fitted with the 56mm aperture mask. The SpaceProbe 3 delivered a noticeably brighter image but image sharpness was quite comparable. The masks are easily affixed to the front of the refractor using parcel tape. Using the 65mm aperture mask, the results were much more comparable, with the refractor yielding a slightly brighter image but image sharpness was still quite comparable. Finally, when the 73mm aperture mask was affixed, the refractor produced the brighter image although image sharpness remained quite comparable. Locked on a stationary target. The Vixen HR 2.4mm ocular with a 2″ Tele Vue Everbrite diagonal. Conclusions: The 76mm SpaceProbe reflector has a light gathering power equivalent to a high quality quality 60 to 65mm refractor. Image sharpness is right up there with the apochromat in these daylight tests. That’s a very good result for a telescope that retails for less than £70 delivered to your door. In comparison, a top quality 60 to 65mm Apo (without a diagonal, eyepieces or mount) could set you back between £400 and £800! Final note: We sent our results to former Sky & Telescope Associate Editor, Tony Flanders, whose opinion I trust, and who has also evaluated the Orion Space Probe 3 in a past review. He agreed with our assessment. Some readers may legitimately ask why a 76mm reflector would not be as good as the equivalent sized refractor. The answer lies in the way these telescopes are designed. The refractor uses a lens to collect light and its transmission is very efficient. Mirrors are not quite as good though, since they reflect a high percentage of the light which strikes them, though not all. For example, if the mirrors both reflect say, 85 per cent of light incident upon them, then the percentage of light that reaches the eye will only be 85 per cent of 85 per cent; that is 72 per cent. Add in the small amount of light lost by the obstructing effect of the secondary mirror and you can begin to appreciate why it is not as efficient as the same size refractor. Having said all that, the little reflector still collects enough light for you to enjoy many objects in the heavens, as we have discovered. Conditions: Good clear sky, no wind, steady conditions. It remains unseasonably cold. Indeed, more snow is forecast for tomorrow. I can’t help but think that this is in part attributed to the solar sunspot minimum that is upon us just now. Nevertheless, the light on the landscape and the lengthening days inform me that April is truly here, lol. At dusk, I set up the little Orion SpaceProbe 3 reflector at the side of the house to observe Venus, which appeared like an intensely bright star sinking into the western sky. Venus is now an evening ‘star’. Excitedly, I turned the telescope on the planet, charging the instrument with the 10mm Explorer II eyepiece delivering 70 diameters. Well, the strongly gibbous disk of the planet was clearly visible, but it was completely featureless. Increasing the power to 140x didn’t really help things all that much. You see, you can discern very little on the Cytherean disk in any telescope, however large and powerful. But what I could see was the six diffraction spikes emanating outward from the brilliant white planet. I found these very striking and quite beautiful to behold. As mentioned previously, this six−pronged diffraction spike is produced as a consequence of the secondary mirrors three spider vanes. In contrast, the view in my larger Newtonians shows cruciform diffraction spikes owing to the four spider vanes supporting their secondary mirrors. At present, Venus is at its smallest; just 10 arc seconds in size. It is much larger when it is in its crescent phase and slowly shrinks as more and more of the disk is revealed. Venus, like our Moon, goes through phases! Venus is covered in quite good detail on pages 348 through 352 of our guide book. And though it looks serene through the telescope, you wouldn’t want to be there. Indeed, it is the nearest thing to a proverbial hell that humans could possibly imagine. Its choking atmosphere of carbon dioxide has generated a massive, run−away greenhouse effect that has raised the temperatures on the surface to about 470C; so hotter than any domestic oven! The atmosphere exerts a pressure in excess of 90 times that found on the Earth at sea level, and then, to add insult to injury, the clouds are not made of cooling water vapour as they are on our world, but instead are composed of droplets of sulphuric acid with a concentration of about 80 per cent. Anyone standing on its surface would be simultaneously crushed, choked, incinerated and corroded to death! Not a pleasant prospect methinks. But Venus was not created for life, whereas the Earth was. Thank goodness for small mercies! I made a drawing of what I saw at the telescope. Venus as seen through the 3 inch SpaceProbe Newtonian on the evening of April 1 2018. Studying Jupiter from the guide book. Conditions: mostly clear, bright gibbous Moon now sinking into the southwestern sky, rather cool. This morning, I enjoyed my very first telescopic observation of the giant planet Jupiter in 2018 as it approached the meridian. I very much wanted to begin this season of observations using the Orion SpaceProbe 3 reflector. And boy was I not disappointed! To see it well, I had to move the telescope(on its mount) across the road to the children’s play park so that I could get a good view of the planet as it hung over the trees like a distant coach lamp. But that was never an issue, as the set up is so lightweight that transporting it over the 80 yards of so was not an issue. Charging the telescope with the 10mm Explorer II eyepiece, the telescope delivered an excellent panoramic view of the planet at 70x with its four large satellites; Io, Europa, Ganymede and Callisto. Even at this power, I was able to see that the planet was flattened at its poles. This is caused by the planet’s rapid rotation on its axis, taking less than 10 hours to complete one revolution. As a result, its equator bulges owing to fierce centrifugal forces, which also somewhat flattens the poles. Jupiter’s shape is thus best described as an oblate spheroid. Using the 2.25x Barlow with the 10mm eyepiece yielded a power of 158x, but while this gave a sharp image, I found that a better image was obtained by backing down on the magnification in order to optimise resolution, contrast and image scale. I reached for my 1.6x Barlow with the 10mm Explorer giving a power of 112x. This gave a wondeful image! I was able to make out the tan coloured equatorial belts and also a few other belts at more northerly and southern latitudes (maybe 5 bands in all?). I could also make out significant detail within the equatorial belts. Studying the image from minute to minute, I tracked the planet simply by nudging the telescope along, applying gentle, finger pressure to the optical tube. Having observed and enjoyed the Giant Planet in many small telescopes over the years, I can report that the 3″ f/9.2 Newtonian provided an image that was significantlty more detailed than a classic, long focus 60mm refractor and was more reminiscent of the details garnered by a very high quality 66mm William Optics triplet apochromatic refractor I had the pleasure of owning many years ago. The SpaceProbe 3 will definitely allow you to study this planet, and with some practice, you will be able to make out other features, such as the famous Great Red Spot(GRS), an enormous, terracotta brick−coloured storm that has persisted on the planet for at least the last few centuries. Such tempests last much longer on this world owing to its lack of a solid surface, which causes terrestrial storms to abate quickly as they get drained of energy when they fall over land. Every now and then (but not on this occasion), one or more of the satellites crosses in front of the planet allowing you to see a disk shaped shadow of the same moon projected onto the cloud tops of this giant world. When you see such an event, it will most assuredly take your breath away! A light blue Wratten no 82 filter is a good tool to enhance belt detail on Jupiter. I watched the planet until it culminated in the south after 2:00 am local time, when it reached the same altitude as Rigel (so not very high) does in my local skies, and was delighted by the high quality images this simple, inexpensive telescope served up. As an experiment, I screwed on a light blue Wratten filter to the same eyepiece/Barlow combination and found that this filter improved the contrast between the dark belts and brighter zones of Jovian atmosphere. I would advise other observers to try this filter (which can be picked up for just a few pounds).The planetary image in the telescope was quite stable and relatively devoid of turbulence in comparison to larger aperture instruments. That’s because small aperture ‘scopes such as the SpaceProbe 3 are relatively insensitive to the vagaries of the atmosphere and are quite well suited to low altitude planetary observations. I left the field tired but genuinely impressed with how well the telescope showed this fascinating target. I even made a quick sketch of the panormaic view at 70x but hope to make a full disk drawing of Jupiter in due course. You can find out much more about Jupiter and its satellite system by consulting pages 362 through 367 of our guide book. The mighty planet Jupiter, as it appeared in the Orion Spaceprobe 3 telescope in the wee small hours of April 28 2018. This evening I set up the Orion Spaceprobe 3 reflector to have a look at Jupiter and was delighted to see that the Great Red Spot was prominent near the central meridian (the planet’s north−south line). I made a quick sketch (shown below) of what I saw using the 10mm Explorer II ocular supplied with the telescope coupled to a 1.6x Barlow yielding a power of 112x and a Wratten no 82A light blue filter. Having a hoot with this charming little telescope! Jupiter with its main belts and zones and the Great Red Spot(GRS) near the planet’s central meridian, as seen through the 76mm f/9.2 Orion Spaceprobe reflector. Local time: 23:4o UT. Spotting the GRS proved rather easy for this telescope even without the filter, its distinctive colour being readily detected.This is an instrument that will certainly allow you to study the constantly changing aspects of this fascinating world. And with more practice, you will become adept at recording its subtle features. We have now come to the end of this journey with the Orion Spaceprobe 3 altazimuth reflector. As I’ve demonstrated, you can accomplish a great deal with the instrument on the Moon, bright planets, the Sun and into the depths of the deep sky. I feel very privileged to have acquired this simple little telescope and it will remain in my stable. Neil English is author of several books on amateur telescopes. This entry was posted in Telescopes by Neil English. Bookmark the permalink.